The 1st Rhinoplasty Meeting was held at the N. Louros Conference Center, MITERA Hospital, on October 14, 2017. The Meeting was jointly organized by the MITERA Hospital Functional & Reconstructive Nasal Surgery Department and the HYGEIA Hospital Endoscopic Paranasal & Skull Base Surgery Department. The invited speakers included Professor Fazil Apaydin, President of the European Academy of Facial Plastic Surgery, from Turkey; Professor Pietro Palma, Honorary President of the European Academy of Facial Plastic Surgery, from Italy; and Dr Frederick J. Menick from the USA. The aim of the Meeting was to present all the latest developments and modern surgical techniques in rhinoplasty, nasal septum surgery and nasal valve surgery. Other techniques presented were those that produce successful and stable results in reconstructive rhinoplasty, which is the complete reconstruction of the nose after partial or complete nasal deficit. 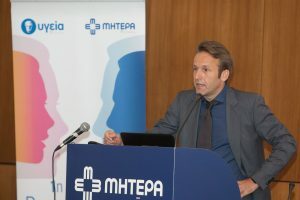 The wide attendance of the invited Greek surgeons, ENT specialists and plastic surgeons encourages us to continue our educational work and introduce the best international techniques to Greece. A large part of the population encounter nasal problems, not only aesthetic, but also functional. We are available to inform and educate new doctors who wish to specialize in this field. It can be concluded that rhinoplasty and nasal septum plastic surgery require continuous education. The modern views on performing cartilage synthesis and maintaining a strong nasal structure differ significantly from the older reduction techniques. The Meeting covered all the topics of modern rhinoplasty, through the interesting speeches delivered by all the doctors on a theoretical level, and the live broadcast of a surgery on a practical level. The world renowned foreign guests presented all the latest developments in the use of autologous grafts and special sutures for successful rhinoplasty results. Dr F. Menick is a leading plastic surgeon who specializes in aesthetic nasal reconstruction. He has laid the foundations in nasal restoration, offering completely natural results, even if starting from scratch. We wish to thank everyone who participated in the meeting and contributed to its success. We are hoping we will continue exchanging views on such an important issues, which concern not just the aesthetic but also the functional part of the procedure, as this is the main aim of modern rhinoplasty.